Summertime is garage sale season, which by default makes it clean-up and clean-out season as well. A cursory look around your house will probably reveal the top oﬀenders when it comes to clutter, and the bathroom is sure to come in with the worst of them. Why not set aside a Saturday morning for bathroom organization? We’ve got a few steps to help you free your countertop and cabinets from all the clutter. Remove everything from the cabinets, working one area at a time. Sort out every expired product, everything you want to throw away, everything that can be donated, and everything you no longer use. Small steps like clearing out one drawer or shelf or cabinet at a time can make bathroom organization feel more manageable. Toss the trash in the dumpster and the donations in the trunk of your car for dropping off at the thrift store. Before deciding on a plan for re-stocking your cabinets with the stuff you want to keep, give everything a good cleaning. You’re already giving a Saturday morning for this, so you might as well make it count. Wipe out all the cabinets, scrub around the fixtures, make it sparkle. As you begin putting your keepers back into the cabinets, group things according to when and where you use them. The red lipstick or silver cuﬄinks you only wear for special occasions don’t need to be in the top drawer. Whatever you use most often when you’re standing at the vanity—floss, hairbrush, deodorant—should all find a home in the most easily-accessible place. After that, group according to category whenever possible—hair styling, shaving, skincare, etc. The process of moving your things back into cabinets and onto shelves may lead you to the realization that you just don’t have the space for all of it. That’s the time to consider relocating some items. Towels, extra toilet paper, cleaning products, and duplicate products are all common bathroom items that might be better stored elsewhere. If after you come to the end of your cleaning, sorting, and relocating, you still find your space feeling over stuffed, it may be time for an upgrade. One of the easiest storage solutions is a new vanity. More cabinet space is always helpful. Get even more storage by going with a floating vanity—extra storage inside and underneath! Our brackets leave you feeling secure and make installation a breeze. Think about how bracing a steaming shower can be on a crisp autumn morning or the luxury of a hot bath on a snowy night. 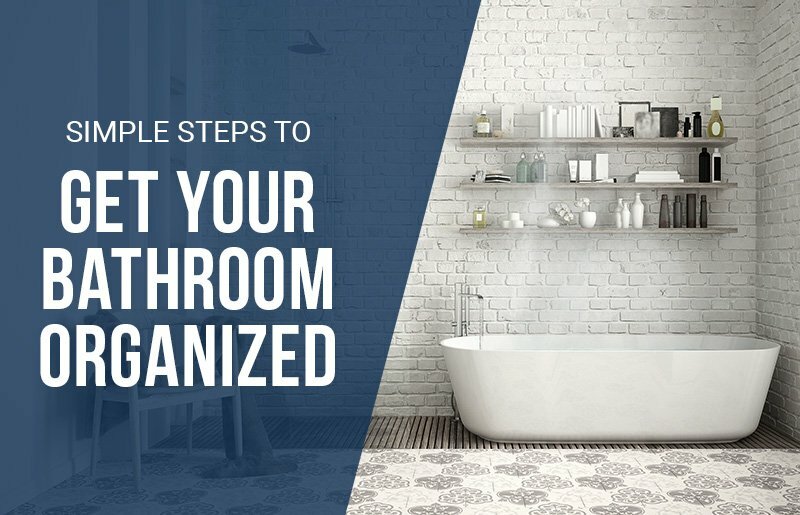 Tackle bathroom organization now, so that you can truly enjoy your bathroom when colder months come around!